As sea going commercial vessels get larger and as more and more technical advances make it easier to operate these huge ships with only one man on the bridge, I ask whether or not we should allow it all. 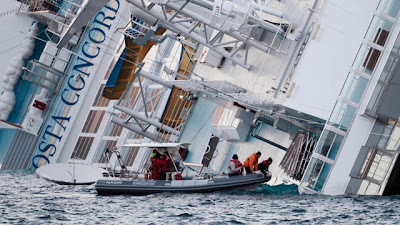 We forget too easily that sailing a vessel in all conditions is about competent and responsible seamanship. A modern Bridge, more like a video game than a ship at sea. My problem with today’s commercial vessels is that all too often they forget the “proper look-out by sight” bit. They rely too heavily on all the electronic navigation aids, such as AIS, Radar, GPS and Chart Plotters, instead of going out and taking a look. 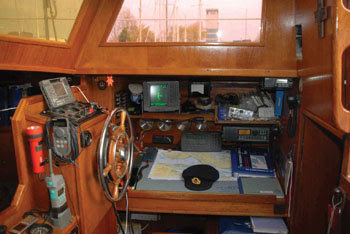 The whole control aspect of modern bridges is more like a virtual computer game than real seamanship. The officer of the watch seldom, if at all, goes out on the bridge and takes a bearing to the nearest headland or light house to check his course. His arrogance is total, as he knows where he is, the chart plotter and GPS tell him. Well they do until it is too late. I once made the same mistake. I relied upon my GPS, visibility was good and I knew where I was. I also knew that there was a rock in the vicinity over which the depth was only 50cms, my vessel drew 1.8m. I was making 6 knots under sail, visibility was good, the sun shone, yet I struck the rock and came to an immediate dead stop in the water!! I was lucky as only my pride was damaged and not my vessel or any of my passengers. Before GPS and all the other electronic gismo’s we now have, we navigated with a certain amount of scepticism. It was more important when navigating in the vicinity of land, to always know with any degree of certainty where you were not, rather than knowing where you were. This helped keep one off the rocks, charted or otherwise. Another aspect of this case are the stories that are coming out about the crew and their handling of the emergency situation. What most people do not realise is that 90% of the crew of a cruise liner are hotel staff and not seamen. They have as much understanding of emergencies at sea as the passengers do. Yes they may be schooled now and then in the procedures for abandoning ship, but they are not sailors and seldom if ever can handle the life boats. The real sailors on board must get a firm grip of the situation early on to suppress the panic that the majority of passengers and hotel staff crew will have. Another factor is of course the many different spoken languages that there will be amongst the crew and passengers. All this will just add to the confusion in the emergency situation. In the circumstances I feel we can be grateful that not more lives were lost. Labels: Costa Concordia. sailing, cruise liners, safety at sea. 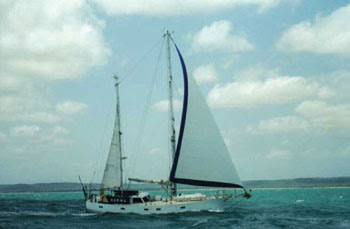 Good background information from a professional sailor! The arrogance of this Captain is staggering, Jan. From the pictures I have seen of him, the recording of the phone conversation he had with the Harbour Master, and the comments he has made, makes me believe he was never really suitable to be a Master of an ocean going vessel. He liked too much being the "pretty boy" in his uniform and playing to the crowd, especially women. Such people fall flat on their face eventually. It is just such a tragedy that innocent passengers who relied on him have lost their lives, when he did fall from grace.